When Molly Wizenberg's father died of cancer, everyone told her to go easy on herself, to hold off on making any major decisions for a while. But when she tried going back to her apartment in Seattle and returning to graduate school, she knew it wasn't possible to resume life as though nothing had happened. So she went to Paris, a city that held vivid memories of a childhood trip with her father, of early morning walks on the cobbled streets of the Latin Quarter and the taste of her first pain au chocolat. She was supposed to be doing research for her dissertation, but more often, she found herself peering through the windows of chocolate shops, trekking across town to try a new pâtisserie, or tasting cheeses at outdoor markets. One evening, when she sat in the Luxembourg Gardens reading cookbooks until it was too dark to see, she realized that her heart was not in her studies but in the kitchen. At first, it wasn't clear where this epiphany might lead. Like her long letters home describing the details of every meal and market, her blog Orangette started out merely as a pleasant pastime. But it wasn't long before her writing and recipes developed an international following. Every week, devoted readers logged on to find out what Wizenberg was cooking, eating, reading, and thinking, and it seemed she had finally found her passion. But the story wasn't over: one reader in particular, a curly-haired, food-loving composer from New York, found himself enchanted by the redhead in Seattle, and their email correspondence blossomed into a long-distance romance. 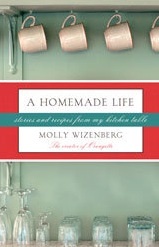 In A Homemade Life: Stories and Recipes from My Kitchen Table, Molly Wizenberg recounts a life with the kitchen at its center. From her mother's pound cake, a staple of summer picnics during her childhood in Oklahoma, to the eggs she cooked for her father during the weeks before his death, food and memories are intimately entwined.